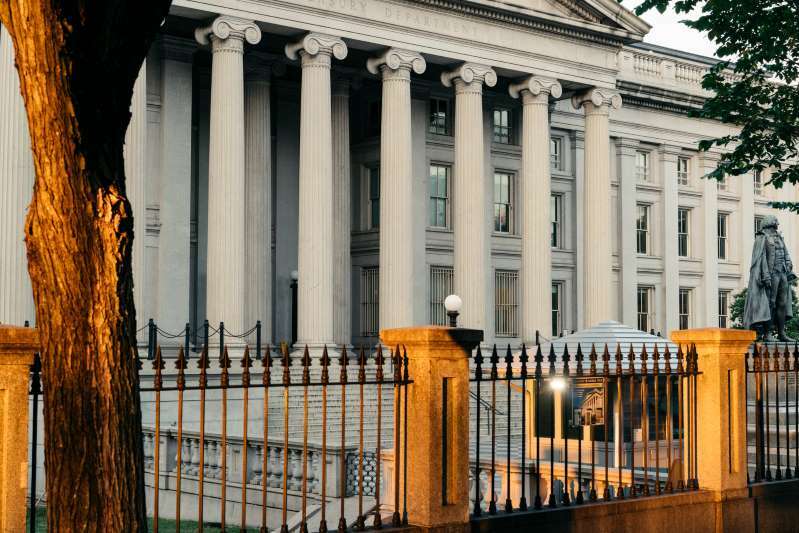 © Justin T. Gellerson for The New York Times Treasury Department data show the federal budget deficit rose to $779 billion in fiscal year 2018, an increase of nearly 17 percent year over year. The federal budget deficit swelled to $779 billion in fiscal year 2018, the Treasury Department said on Monday, driven in large part by a sharp decline in corporate tax revenues after the Trump tax cuts took effect. The deficit rose nearly 17 percent year over year, from $666 billion in 2017. It is now on pace to top $1 trillion a year before the next presidential election, according to forecasts from the Trump administration and outside analysts. The deficit for the 2018 fiscal year, which ended Sept. 30, was the largest since when the economy and federal revenues were still recovering from the depths of the recession. Administration officials attributed the deficit’s rise to greater federal spending, including the military and domestic spending increases that President Trump approved this year, not the $1.5 trillion tax cut. But the numbers released by Mr. Mnuchin’s department suggest falling revenues were a far larger contributor to the rising deficit than higher spending. Federal outlays increased for the fiscal year, but, because the economy grew at a faster pace than outlays did the previous year, they fell as a share of the economy, to 20.3 percent from 20.7 percent. Federal revenues rose by 0.2 percent from year 2017. That was a slowdown from previous years. Revenues rose by 1.5 percent between fiscal years 2016 and 2017. They rose by 0.5 percent between 2015 and 2016, when economic growth was considerably slower than it has been over the last year. Between 2014 and 2015, they rose by 7.5 percent. As a share of the economy, revenues fell to 16.5 percent in fiscal year 2018, from 17.2 percent the year before. Revenues are now nearly a percentage point lower than their average for the last 40 years, the Treasury Department said in its news release. Personal income tax collections rose slightly over the past fiscal year, the Treasury data show, though in September they were lower than they were a year ago. The big revenue drop came on the business side. Corporate tax revenues have fallen by a third from a comparable period a year ago, a direct consequence of the tax law signed last year, which reduced the top corporate rate to 21 percent from 35 percent. For the full 2018 fiscal year, corporate tax receipts were nearly $205 billion. That figure is a drop from $297 billion in fiscal year 2017. The 2018 numbers do not reflect a full year of effects from the Trump tax cuts, which also included cuts for individuals and owners of so-called pass-through corporations. Most of the new law’s provisions took effect in January. The numbers suggest that the tariffs Mr. Trump has imposed on imported metals from several countries, and on $250 billion of imported goods from China, have not begun to generate enough revenue to help pay down the national debt, as Mr. Trump has promised, though they are producing more revenue than in previous years. For the 2018 fiscal year, the category that includes Mr. Trump’s tariffs, “customs duties,” brought in about $41.3 billion in federal revenues. That was up from about $34.6 billion in 2017, an increase of nearly 20 percent. Many Republicans, including Mr. Mnuchin, said during last year’s debate over tax policy that the proposed cuts would pay for themselves by producing faster economic growth and correspondingly higher federal revenues. Outside analysts disagreed. The Joint Committee on Taxation, the official tax scorekeeper of Congress, projected that the law would reduce revenues by $1 trillion, even when accounting for additional growth.